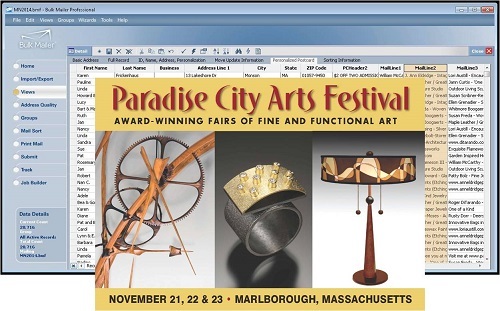 Paradise City Arts Festivals, a producer of high end fine and functional art shows, promotes the work of hundreds of its exhibitors in order to attract attendees to its shows. They maintain an extensive electronic and direct mail database of contacts to drive their own in-house marketing campaigns. However, while many exhibitors had their own customer lists, few had the time, money and expertise to execute their own communication plans. Extending the existing MS Office contact database, we created a system to provide partner marketing communication services to Paradise City’s exhibitors. Exhibiting artists submit customer lists that are used in direct and electronic mail campaigns with messages personalized to their specific customers. Stored and managed in distinct virtual databases, customer contact information is cleansed, normalized, de-duped and consolidated into a standard format that reduces errors and downstream production costs. Integrating with Bulker Mailer Professional and VerticalResponse, direct and electronic mailing systems automate bulk mailing while minimizing unnecessary postal fees. Attendance and customer histories are updated using coded printed and mobile discount admission coupons. With over a 100 partner artists taking advantage of these services, Paradise City sends larger mailings to better targeted prospects resulting in greater attendance by qualified collectors. Moreover, providing low-cost personalized mailing services not only increases exhibitor sales but also builds demand for exhibition space. Capturing attendee contact information and updating customer histories improves the effectiveness of future communications. Most importantly, marketing communications that deliver messages flexibly targeted to customers interested in each show’s artistic aesthetic provides a path to sustainable customer growth.